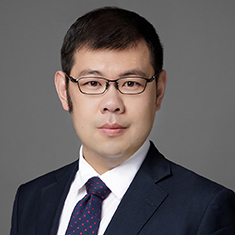 Lijie Han is a partner in the Corporate practice of our Shanghai office, where he focuses on complex merger and acquisition transactions, project development and finance, and antitrust and competition. He has deep experience advising Chinese state-owned companies, investment banks and technology companies on a wide array of transactions, using a multidisciplinary approach that ensures that deals get done in compliance with Chinese regulatory requirements. Lijie regularly represents Chinese companies in their business activities globally as well as US and European companies and investors doing business in China. Shown below is a selection of Lijie’s engagements. While at a prior firm, representation of a Chinese real estate and leisure group in the $380 million acquisition, and subsequent $420 million sale, of an international luxury and adventure tour operator. While at a prior firm, representation of a vertically integrated energy and chemical company in the $1 billion acquisition of downstream assets in South Africa. While at a prior firm, representation of a consumer electronics company in its proposed $2 billion sale to a leading Chinese technology company. While at a prior firm, representation of a global alternative asset manager in an investment in a major subsidiary of Yuntianhua Group, Co., Ltd., a company listed on the Shanghai Stock Exchange. While at a prior firm, representation of an integrated global energy company in the sale of a significant interest in a Brazil-based oil and gas exploration company. While at a prior firm, representation of a state-owned contractor for the Chinese space program in its $1 billion bid for auto assets in Germany. While at a prior firm, representation of a wealth management and financial services firm as sole financial advisor and underwriter of an investment holding company's HK$2.22 billion acquisition of interests in five joint ventures in the PRC from its ultimate controlling shareholder, in addition to a HK$3.49 billion rights issue. While at a prior firm, representation of lenders in the financing of Blackstone Group's acquisition of Pactera Software Group, a US-listed company based in China. While at a prior firm, representation of the ownership arm of a Chinese state-owned shipbuilding company in the acquisition of a significant stake in a Hong Kong-listed company. While at a prior firm, representation of an investment consortium as financial advisor to Wm. Wrigley Jr. Company in its $23 billion acquisition by Mars Incorporation and refinancing of existing debts. While at a prior firm, representation of one of China's largest banks in financing China Jiuquan Iron & Steel (Group) Company's $300 million acquisition of mining assets and equity interests in related companies in Jamaica from UC Rusal. While at a prior firm, representation of a Chinese institutional bank in financing China Three Gorges Group's $950 million acquisition of Brazilian assets from Duke Energy International. While at a prior firm, representation of the sponsors in the US$19 billion financing of Yamal LNG Project in Russia. While at a prior firm, representation of the sponsors in the $1.3 billion financing of the Jawa 7 coal-fired power project in Indonesia. While at a prior firm, representation of a Chinese construction and engineering company in its proposed investment, development and financing of commercial real estate in New York City and San Francisco. While at a prior firm, representation of lenders in the US$8.5 billion financing of the Australia Pacific LNG Project. While at a prior firm, representation of a Chinese institutional bank in the proposed financing of the Cernavoda Nuclear Power Plant Units 3 and 4 in Romania. While at a prior firm, representation of a leading Chinese Internet company in its global competition strategies and compliance. While at a prior firm, representation of several telecommunications companies and investment managers in antitrust matters, including merger control filings with the Ministry of Commerce in China. While at a prior firm, representation of one of the largest wire and cable manufacturers in the world in a China National Development and Reform Commission investigation of Japanese auto makers for price fixing.